Model E2408 © 1986 Bally Mfg. 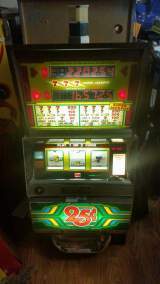 Co.
3-reel, 2-coin double individual progressive multipliers. In the early 1980's, there was very limited, if any, choices to use large displays to show numbers for jackpots. And, since LEDs probably weren't capable, the company opted to use a new form of electro-mechanical displays. Each segment of the display is connected to a plunger. When it needs to show the segment, the coil is energized to push, thus turning the segment to show state. When it is not needed, the coil is energized with negative voltage to pull, turning the segment to hide state.